Satguru Hari Singh Ji continued.. The Namdhari Sikhs believe that Guru Gobind Singh did not die at Nanded, but made a secret exit from the funeral pyre and eventually settled in Nabha, where he stayed for 103 years under the guise of Baba Ajaypal Singh. 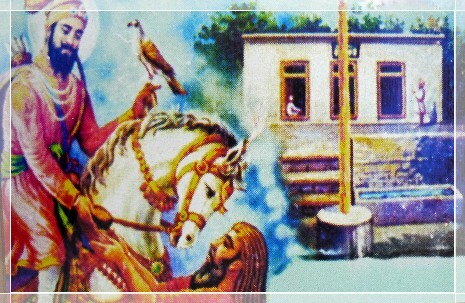 During this period he met Baba (Guru) Balak Singh at Hazro Sahib and conferred the 'Gurgaddi' on him. Until he finally departed this life in S. 1869 [1812 AC.] he continued, as previously, to assist his Sikhs in whatever trials they might encounter. The Janam Sakhis of Guru Nanak, which are written during the Guru periods, long before the founding of the Namdhari Sikhs. These Janam Sakhis were written in 1777 AD (printed by "Publication Bureau"-Punjab University, Patiala in 1985 AD. It is edited by Dr. Gurdev Singh. ), 1890 AD in Lahore. Many other hand-written and printed versions of Janam Sakhis, which clearly disclose the foretelling of the fourteen Gurus. Dr. Surinder Singh Kohli has written a book "Sikh Predictions", published in 1998. In this book there are quite a few pointers to the fourteen Gurus and other relevant excerpts. THE NAMDHARI SIKHS.... The orthodox belief that the line of personal Gurus ended with the death of Guru Gobind Singh is denied by the Namdharis. They insist that the tenth Guru lived for many years after 1708, eventually bestowing the succession on Balak Singh of Hazro.... They attach equal importance to the Adi Granth and Dasam Granth, and they include the Dasam Granth composition Chandi di Var in their daily nit-nem. He further writes; "There is no reliable historical work which suggests a) that the Guru died in the presence of the Sikhs; (b) that the Sikhs actually performed the cremation by setting light to the pyre. What history tells us is that the Guru, still alive, sat on the pyre and then ordered the Sikhs to leave the enclosure, which had been constructed by placing a screen around the pyre. Indeed, he went even further than this. He sternly commanded them to stand with their backs to the enclosure and then insisting that his Sikhs, having left it, should stand with their backs to it?" "The Office of the Guru, however, was not filled up; first because the Sikhs long expected the return of Govind Singh, of whose death they never received any certain information; and also, when after so long a time had elapsed since his escape, that the fact of his death could no longer be doubted, the whole frame of their society, if I may so express it, had undergone, a change. Govind Singh had remained, therefore, up to this time, the last acknowledged spiritual head of the Sikhs." Writer/Journalist Shiv Lal in an article in a weekly periodical "Redical" writes under the heading "New Light on the Life and Work of Guru Gobind Singh." "Contrary to the general belief that Guru Gobind Singh's worldly life came to an end with his disappearance from Nander, there is ample evidence of considerable historical veracity to show that the great Guru travelled from the South back to Punjab and lived for another 100 years an active life in keeping with his genius and vow of service of the country and its people." Bhai Kahan Singh Nabha, an eminent Sikh scholar, writer of the great 'Mahan Kosh' and many other knowledgeable Granths, was of the conviction that Guru Gobind Singh did not die at Nander but came to Nabha and stayed in a small grove of forest, under the name of Baba Ajaypal Singh. In an article written in the monthly magazine "Punjabi Bahen" in May 1916, he wrote under the heading of "Itihas de Unlikhey Patrey" (The unwritten History), wherein he narrated the story of Guru Gobind Singh-not dying at Nander but coming over to Nabha and staying there under the assumed name of Ajaypal Singh. In 1966, Guru Gobind Singh foundation printed a souvenir "Tenth Master" in which a prominent Sikh personality Divan Singh Maftoon wrote exactly what Bhai Kahn Singh had written in 1916 and corroborated his story that Guru Gobind Singh did not die at Nander, but came to live in Nabha under the guise of Ajaypal Singh. In the "Daily Milap', the editor Ranbir wrote on 31st January 1973; "I am convinced that Guru Gobind Singh did not die at Nander but secretly slipped away from there. More research is needed to verify this." Sant Das Chhiber, mentioned previously, wrote in the end of the same Janam Sakhi (mentioned above) - his actual discourse with Guru Gobind Singh. This was confirmed by Bhai Randhir Singh, the research scholar in his "Itihasak Pattar" of April 1951. The Panth Parkash of Giani Gian Singh , edited by Giani Kirpal Singh (ex-head granthi of Darbar Sahib), printed in 1977, clearly states the conferring of the Gurgaddi by Guru Gobind Singh to Guru Balak Singh and claiming himself to be the reincarnation of Satguru Ram Singh. An extract from "The Sikhs of Punjab" by J.S.Grewal on page 147 denotes:- "The idea of the Guru-Panth became stronger with the increasing importance of Singh identity. In a tract published in 1919, it was argued that no human being could be the Guru of the Sikhs after Guru Gobind Singh decided to vest Guruship in the Adi Granth. The Sikhs were 'to view themselves as the Panth and not to recognize any single person as their sole leader'. The loss of Guru-Panth was emerging as clearly as the equation of the Guru with the Adi Granth." If the Granth 'Guru' was an established fact, the above decree by the 'Singh Sabha' in "1919" (nearly two hundred years after Guru Gobind Singh) would not have been necessary. These are but a few facts that prove that the Guru did not die at Nanded - nor did He give the 'gurgaddi' to the Adi Granth. Further no Adi Granth Sahib had the prefix "Guru" scribed on it until the 1860's. i.e. only during the Singh Sabha time did this prefix 'Guru' was added to the Granth Sahib - as all manuscripts available before the Singh Sabha time have Adi Granth or Pothi Sahib etc., scribed on them. Also a copy of old GUTKAs which has the Sikh Ardas finishing at Guru Gobind Singh and not once the Guru Granth Sahib has been mentioned. Had the Adi Granth been the 'Guru' - then, until 1897 this would have been a confirmed belief and the Sikh Ardas would not have been such. 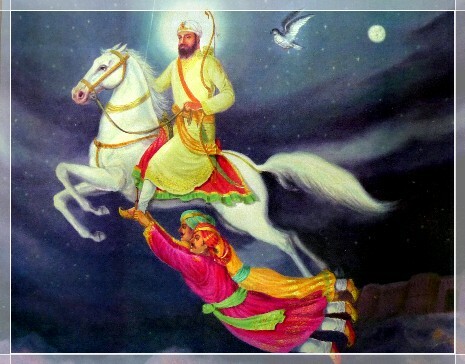 After his presumed death-Guru Gobind Singh rescues Bala Rai and Rustam Rai from the Sitara Fort in Poona. Guru Gobind Singh Ji meeting a Sadhu after his presumed death, and asking him to assure the Sikhs that he was well and they should not grieve him.